Documents highlighting the secrecy and tension involved in communication and negotiation between the British government and the IRA throughout ‘the Troubles’ were unveiled in NUI Galway at the launch of the Brendan Duddy Archive on Tuesday 22 November. The archive holds documents from the three main periods during which Brendan Duddy secretly acted as an intermediary between the British government and the IRA. The first was in the early and mid 1970s when Duddy acted as intermediary during a series of contacts over the release of hostages and the ending of hunger strikes. In 1980 and 1981 Duddy acted again as intermediary during the Republican hunger strikes. In July 1981 he began to record these contacts, conducted mainly by telephone, in a red hardbound notebook, the ‘Red book’. Between 1990 and 1993 Duddy was again active at this intersection after a new Northern Ireland Secretary of State, Sir Peter Brooke, made the decision to try to incorporate the Provisionals in a political settlement, an effort continued by his successor Sir Patrick Mayhew. The archive contains over 700 descriptive items of paper and sound archives which will be available to scholars and bona fide researchers from January 2012. The archive includes coded diaries of contact as well as messages exchanged between the British Government and the Provisional Republican leadership. 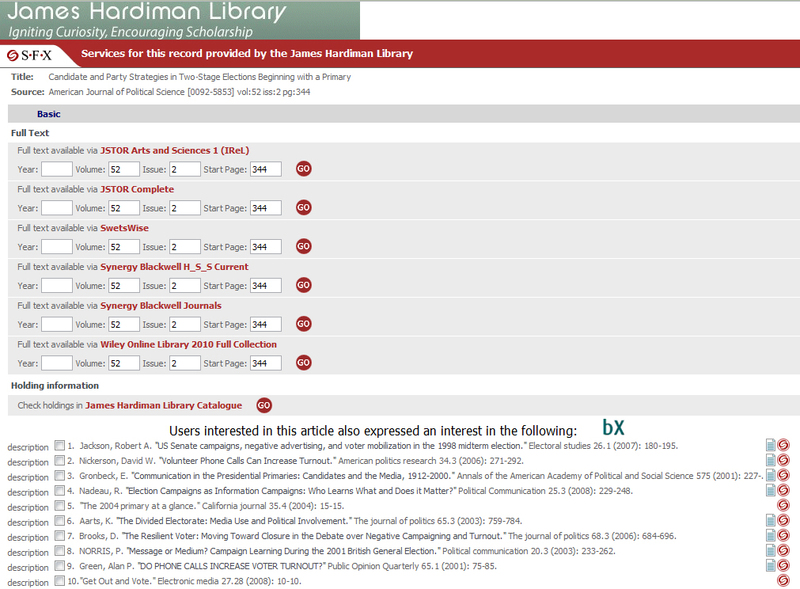 The Library has recently implemented a trial of bX, Ex Libris’ scholarly recommender service. bX is now embedded with our SFX service to provide enhanced opportunities for academic discovery for our users. Users of SFX will now see recommended articles where possible, along with links to fulltext if available - see the screenshot below for more details. It works by analysing global usage of SFX for all Ex Libris customers, and manipulates this information to show our users other articles the global scholarly community found relevant – similar to Amazon’s ‘Other Customers Also Bought ...‘ feature. Skills4Study- Successful Study Starts Here! Access Skills4Study through Blackboard now! Test your own strengths and weaknesses in each other these areas and then proceed to develop your skills. Due to essential maintenance, access to Wiley Online may be interrupted on Saturday Nov 5th at 10am, for up to 2 hours. This November, in addition to the regular one-on-one teaching sessions, the Academic Writing Centre will provide two special workshops on essay writing. The workshops have been specially designed for second-year Arts students, but other students are also welcome to apply. 8 November 2011 at 6pm. Places are strictly limited, and early booking is strongly encouraged. To make sure of a place, please send an email to writingcentre@nuigalway.ie stating your name and discipline of study. A brief description of your expectations or the problems you hope to address would be also particularly helpful.